With a stay at Royal Aashiyana Palace Hotel in Jaipur, you'll be within a 15-minute drive of M.I. Road and Sawai Mansingh Stadium. 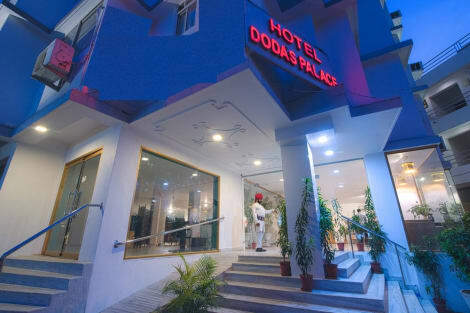 This hotel is 2.6 mi (4.3 km) from Hawa Mahal and 5.5 mi (8.8 km) from Jal Mahal. Featured amenities include wired Internet access (surcharge), complimentary newspapers in the lobby, and dry cleaning/laundry services. A train station pick-up service is provided at no charge (available on request), and free valet parking is available onsite. With a stay at Nahar Singh Haveli in Jaipur (Sindhi Camp), you'll be minutes from Station Road and close to Hawa Mahal. 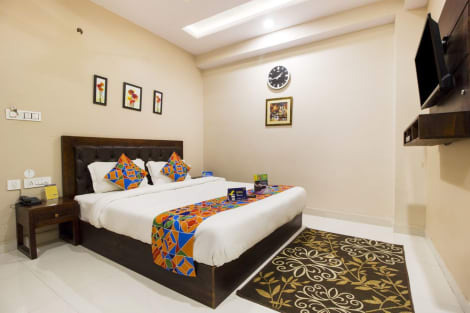 This hotel is within close proximity of Sansar Chandra Road and Ajmer Road. Enjoy Indian cuisine at Kalyan Rooftop Restaurant, one of the hotel's 2 restaurants, or stay in and take advantage of the 24-hour room service. Snacks are also available at the coffee shop/café. Relax with a refreshing drink at one of the 2 bars/lounges. Full breakfasts are available daily for a fee. 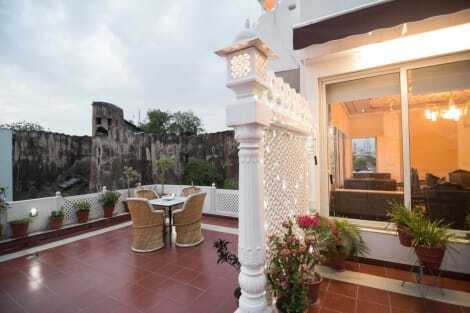 This charming hotel is situated in Jaipur. The total number of guests rooms is 19. Pets are not allowed at Hotel Maya Niwas. 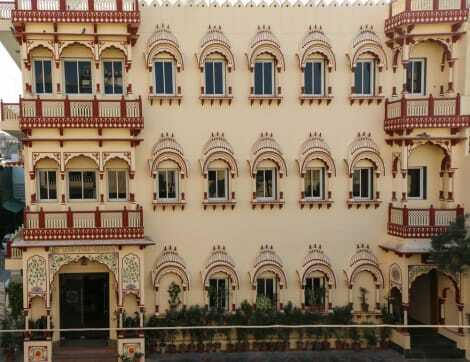 With a stay at FabExpress Travelers Lodge in Jaipur, you'll be close to ISKCON Jaipur, Sri Sri Giridhari Dauji Temple and Sawai Mansingh Stadium. 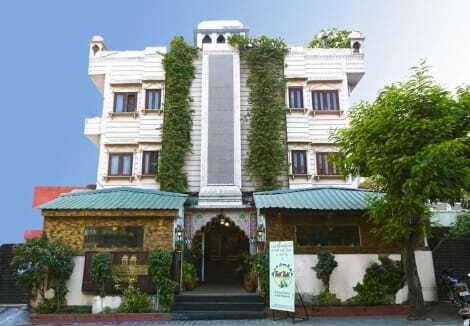 This hotel is within the vicinity of Ajmer Road and World Trade Park. Enjoy international cuisine at Restaurant, one of the hotel's 3 restaurants, or stay in and take advantage of the 24-hour room service. Wrap up your day with a drink at the bar/lounge. Buffet breakfasts are available daily from 8 AM to 10 AM for a fee. Enjoy recreation amenities such as a health club or take in the view from a terrace. Additional features at this hotel include complimentary wireless Internet access and tour/ticket assistance. Located in Jaipur, Ratan Niwas is within a 15-minute drive of M.I. Road and Sawai Mansingh Stadium. 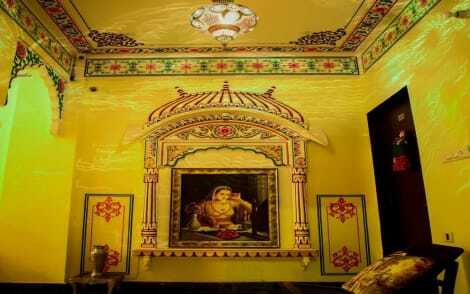 This guesthouse is 3 mi (4.9 km) from Hawa Mahal and 5.8 mi (9.4 km) from Jal Mahal. Enjoy a meal at the restaurant, or stay in and take advantage of the hotel's room service (during limited hours). Continental breakfasts are available daily from 7:30 AM to 10 AM for a fee. Enjoy a meal at the restaurant, or stay in and take advantage of the hotel's room service (during limited hours). Mingle with other guests at the complimentary reception, held daily. Cooked-to-order breakfasts are available daily from 7 AM to 11 AM for a fee. Jaipur, the capital of the Northern Indian state of Rajasthan is otherwise known as the Pink City of India. Founded in 1727 by Maharaja Sawai Jai Singh II, the city boasts some impressive architecture, including the royal palace of Hawa Mahal, with its formal gardens and lake. In the distance the Nahargarh Fort, once the residence of the King Sawai Jai Singh II, sits proudly on a hillside with far reaching views of the old city. As a major tourist destination, Jaipur Hotels are plentiful and varied, with something to suite all budgets. The observatory, known as Jantar Mantar is on the World Heritage Site register due to its extraordinary architectural design and astrological engineering. Commissioned during the reign of Jai Singh II, fourteen geometric devices where built to measure time and track the movement of the heavens. It's still used today by astronomers and is a huge draw to tourists with an interest in the stars. Take an elephant ride up to the gates of the Amer Fort, located high up on the hillside overlooking the town of Amer. It's a spectacular sight, with its opulent red sandstone and marble palace, Hindu architecture and views over the Maota Lake. Make your way to the connected Jaigarh Fort, built in 1726 as additional protection for the Amber Fort. With an interesting armoury and museum to explore there is plenty to see. Other noSEOSITE_LEVEL_DESCRIPTION landmarks include the ancient Sanganeri Gate, the Sri Kali Temple and the Jal Mahal, the ‘Water Palace', which can be accessed via wooden boats. The Jaipur Zoo is a huge tourist attraction and a major player in the national effort to conserve and protect the wild life of India. Alternatively, the Albert Hall Museum, known as the state museum of Rajasthan is well worth a visit if you're interested in art. Beautiful paintings, metal sculptures, textiles and colourful artefacts are on display. The building dates back to 1887 and is perfect example of Indo-Saracenic architecture. Situated within the beautiful landscaped grounds of the historic Ram Niwas Garden, there's also the Ravindra Rang Manch Theatre, a bird park and an art gallery within its boundaries. Bustling with skilled artisans, craftsmen and artists, Jaipur is a major centre to arts and crafts, from stone carving, to shellac work, block printing to fine jewellery. The city provides traditional shops offering authentic Indian pottery, carpets, and textiles. Stroll around the Johari bazar, or the Haldiyon ka Raasta and take in the colour and vibrancy of this exciting city. Be prepared for exotic spices and colour. The food is glorious, with local dishes including Dal Baati Churma, a lentil based dish and Missi Roti, a flat bread made from wheat and seasoned with spices. For those with a sweet tooth, try the Ghevar, made from oil, flour and sugar syrup or Gajak, a dry dessert, made from sesame seeds and sugar.